Ginger Scented Geranium (p. torento) - Rounded leathery green leaves have a spicy ginger scent. Strong upright growth habit and purple-pink flowers when in bloom. Culinary. 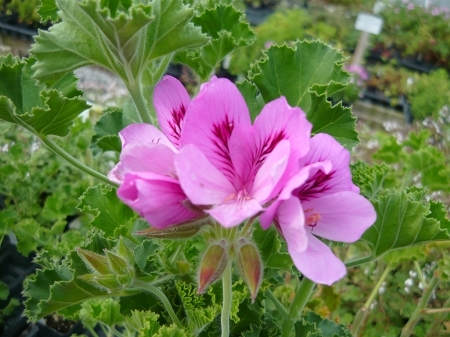 Like all pelargoniums, needs a sunny location and well drained soil. Perennial zones 10-11+ Live starter plant in 3 inch container.